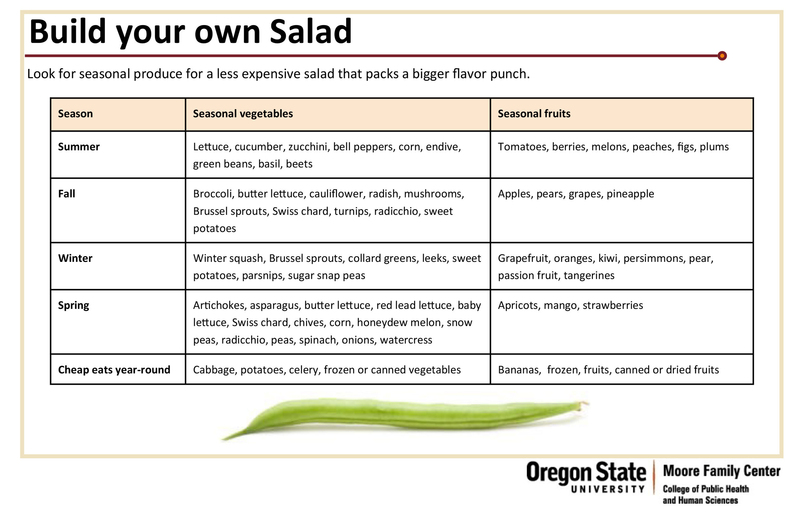 If you’re feeling inventive, you can put your chef hat on and create your own seasonal salads and salad dressings based on the charts below from the College of Public Health and Human Science’s Moore Family Center for Whole Grain Foods, Nutrition and Preventive Health . 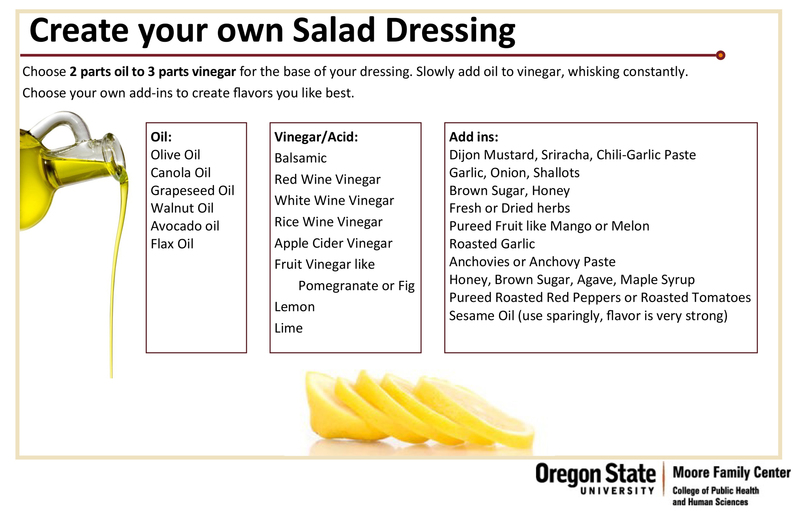 The center’s endowed director, Emily Ho, says that when creating or using a store-bought salad dressing it’s important is to watch the amount of fat and/or oil you add. 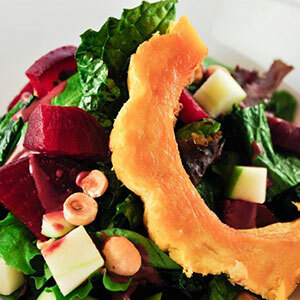 Below, you’ll find some tasty creations that are sure to leave your palette hungry for more greens. 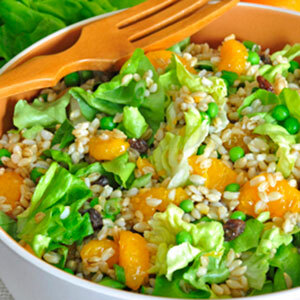 There is a bounty of resources available to help build variety into your salads, including tested and approved recipes from Food Hero. You can also see tips for growing your own salad greens in Oregon. In a small bowl, make the dressing by whisking together the yogurt, apple cider vinegar, honey, salt and pepper. 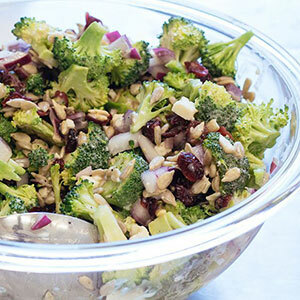 In a large bowl, mix the broccoli florets, red onion, dried cranberries, sunflower seeds and feta cheese. Add the dressing and stir to combine. Cover and chill for at least 30 minutes. Serve immediately or make ahead up to 24 hours. Preheat oven to 350 degrees. Oil and roast the beets on a lined baking sheet for 30-40 minutes (depending on size). Peel skin and cut into chunks. Roast squash with skin on for 20 minutes. Cut into rings and toss with oil. Squeeze dressing into mixing bowl. Add greens, beets, hazelnuts (reserve a few) and ¼ cup apples and toss. Place mixture onto plate and add remaining of apples and top with squash rings. Combine all ingredients except for oil and place in blender. Make sure to fully blend. Turn blender to low and slowly add the oil until all gone. Combine barely and water in a 2-3 quart saucepan. Bring to boil, then turn to low. Cover and cook for 45 minutes. Rinse cooked barely briefly in cold water and drain. Add remaining ingredients and mix well. Refrigerate leftovers within 2 hours.